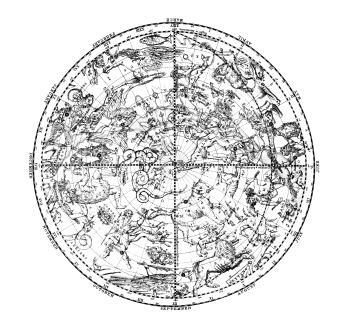 An important aspect of the classical or traditional school of feng shui, Chinese star maps are generally referred to as star charts. Over time, the chi of the house changes, based on the positioning of the stars and the sectors of the house where they appear at different times. As in astronomy, the stars are in constant motion and changes take place continuously over time. The creation of a Flying Star Map is based on the year that construction was completed and not when the owners of the house moved in. Owners move in and out of homes, but a home is built one time and although may have renovations that must be taken into consideration when calculating flying stars. The most consistent date is when construction is completed. This date is considered the birth date of the house and does not change but may be amended if the structure undergoes a major renovation. In addition to the house's Flying Star Chart, each family member would need to have a flying chart completed that combines their flying stars with that of the house. This is the only way to ascertain which areas of the home is best suited for each member. With such a chart you know where the best place is in your home to eat, sleep, work, play, and study. Concept of time which is divided into cycles that last for twenty years. To determine the positive and negative areas of a chart, numbers are used to represent the positions of the placement of the stars. The chart is then laid over the floor plan of the home. In Flying Star feng shui there are three main types of star charts; the Twenty-Year Flying Star Chart, the Yearly Flying Start Chart and the Monthly Flying Star Chart. The Twenty-Year Chart is the one that you use to locate the house or office that is best for you. This chart is considered the basic chart in Flying Star feng shui. For the entire twenty-year period, it will show you the stars that have an influence on the structure. These won't change from one period to the next since they're based on your house's birth date (construction completion date). A Yearly Flying Star Chart is used to keep your house under the best influences as possible. This is accomplished by making any changes or remedies needed to divert unfortunate stars throughout the year. You can also use this chart to make any changes that will enhance the stars of good fortune. You can take advantage of these auspicious stars and their location to further your career, studies, health, wealth, and relationships. A Monthly Flying Star Chart breaks down the activities of the stars even further, giving you the opportunity to use extra caution if a bad star is in a certain sector of your home or office for that particular month. You can determine if it is a good time for an office party, open house or other social gathering. Perhaps you want to add on to a bedroom or do some other renovation or activity in your home or place of business. this chart can guide you in such a project and help you steer clear of an area best left undisturbed. Additional Flying Star charts include Daily Flying Star charts and Bi-hourly Flying Star charts. Each of the Flying Stars is either positive or negative. Positive stars are considered timely and negative stars are considered untimely. The determining factor of each star depends on the specific activation of the star and the period of reference. Chinese star maps show the positions of the Flying Stars, both timely and untimely. This knowledge provides practitioners of traditional feng shui the opportunity to activate the proper feng shui cures.